Classic 2D platforming shooters have long been a staple of Nintendo systems. 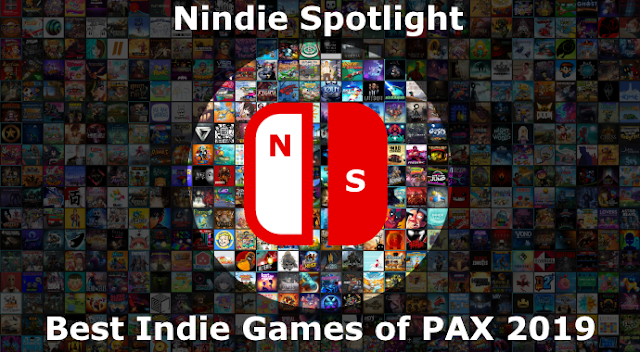 While most people associate this genre with the likes of the MegaMan series since Capcom hasn’t made a new one in quite some time some other companies have looked to step in to fill the void. 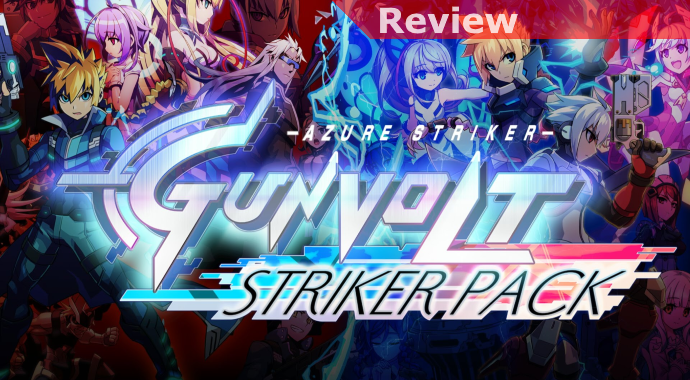 One such company is Inti Creates, who has made other contributions to the genre, but in this case we’re focused squarely on the contents of the Striker Pack, Azure Striker Gunvolt, and its sequel, both originally released on the 3DS. If you’re unfamiliar with the series, the gameplay hook is a bit different than your usual fare. Rather than you sporting a powerful weapon that you’ll upgrade and then use to take out bad guys your weapon is quite weak. The quills it shoots, however, can then be used to deliver electricity from the field that you can create around you that will do the bulk of the damage. 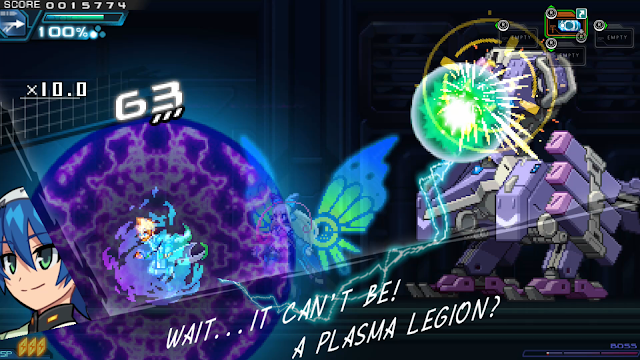 This makes for a far more “stick and move” style of play where you’ll need to get a clear shot to stick your enemy (up to 3 times for best effect) and then electrocute them as you try to stay clear of their attacks. It’s a nice and refreshing change. In many ways playing the original and the sequel back to back feels like a nice overall progression as the second picks up not long after the end of the first. Many of the base enemies and the general feel is roughly the same but there’s more refinement in the level design and, in particular, the boss battles continue to escalate nicely in challenge and overall craziness. The general format in a level of working on a variety of jumping and environmental puzzles while taking out bad guys, looking for special items that can be used to power yourself up further, and then facing off with a boss is familiar and satisfying. Keeping in mind these are two titles having been ported from the 3DS it’s a bit of a mixed bag. On the one hand it is nice that the cutscene elements and overlays have generally been redone with HD art so the presentation is excellent and attractive. On the other the core engine for the gameplay itself still shows its roots from a lower-resolution system so things can be blocky but at least these were extremely attractive games on the 3DS so you’re hardly slumming by any means. Characters are big, detailed, and generally look great, you’ll just still feel like you’re playing a ported game. If you’ve never indulged in the series until now this pack would be an excellent opportunity to do so. They definitely represent a change of pace on the system and have core gameplay unlike just about anything I’ve played. The action is fast and pretty frantic and taking down some of the games’ bosses can take some real effort. 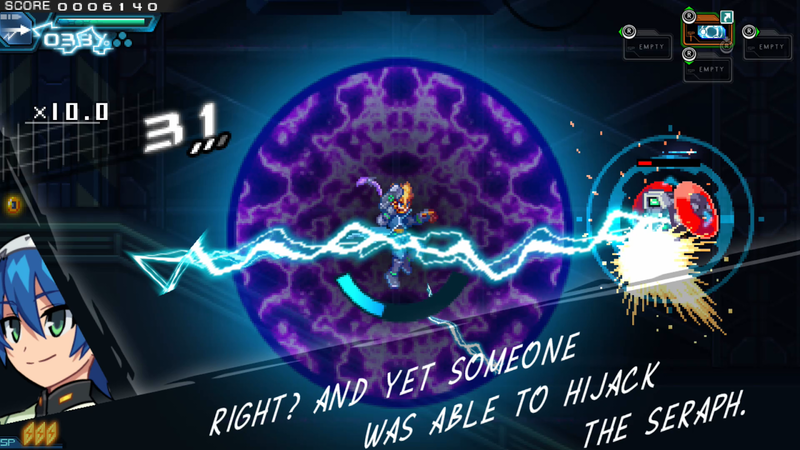 If you’ve been craving a platforming shooter the Striker Pack is worth a look!